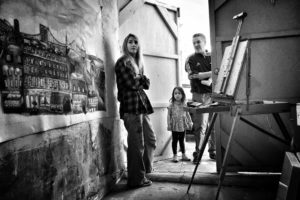 Home / Uncategorized / Mission Open Studios in April! I am so excited to share my new studio! It has been such a cozy, happy place where I have been very productive. Please come join me on the weekend of April 7th and 8th, from noon to 6pm. I will also be having a special show on the Friday night, April 6th from 6 to 9. This is a show that I will need darkness for. A beautiful surprise, so stop by when it gets dark! The address is 1092 Capp st, in the Mission, San Francisco. I have been meeting a lot of the community and am proud to have my new studio in this part of the Mission. Hope you can stop by!